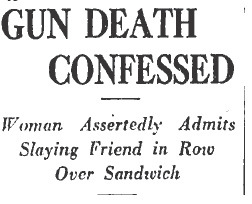 The fight between Isa Lang and Edith Eufala Norwood over an avocado sandwich ended in death. Isa had grabbed a gun from her former landlady’s closet and shot her in the back of the head. Eufala died instantly. 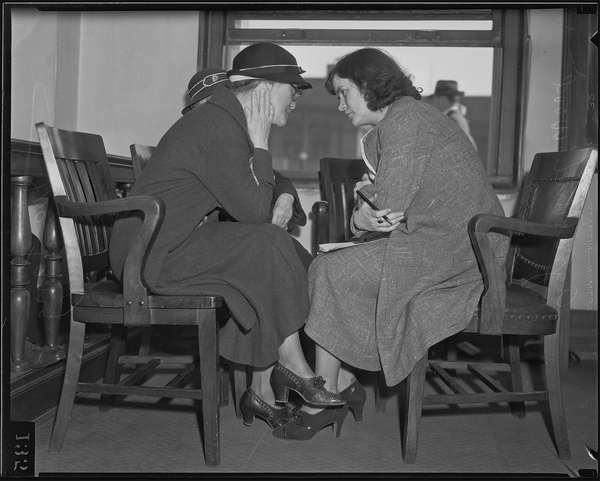 Isa was indicted for the slaying and ordered to stand trial on March 7, 1935 in Judge Doran’s court. She entered a a double plea of not guilty and not guilty by reason of insanity; which seemed reasonable given her stated motive for the murder. Aside from the harsh words, Isa’s rage was triggered because she claimed that she had used her own bread to make lunch. She didn’t reveal the source of the avocados. Isa testified that she didn’t recall pulling the trigger, but admitted that she must have done it. Jurors learned that the two women had been friends for the several years during which Isa had been living in Eufala’s home. But their friendship ended when Isa was told to move out. The verdict and sentence ended the first phase of Isa’s trial–next the jury would have to decide if she was insane when she committed the murder. Three alienists (psychiatrists) testified that while Isa was undoubtedly eccentric whe was not legally insane when she shot Eufala. Isa’s defense team offered their own witnesses in an effort to prove that she was not mentally responsible for the shooting. It took the jury five minutes to arrive at a decision–Isa was sane–she would serve life in the State Prison for Women at Tehachapi. There were few high profile female killers, especially during the 1930s, who weren’t interviewed by Aggie Underwood. Aggie started working as a reporter for the Evening Herald & Express in January 1935 and, as you can see from the photo she scored an interview with Isa. 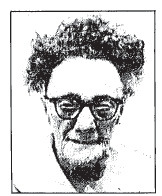 There were no further newspaper of reports on Isa until November 1976 when the Los Angeles Times did a piece on her. Isa had been a prisoner longer than any other woman in California–but that wasn’t her only claim to fame. Astonishingly, Isa was able to convince the Department of Correction that by giving up her parole and returning to prison she would be treated more humanely than she had been in the nursing home on the outside. Actually, now that I think about some of the stories I’ve read about nursing homes, maybe her request wasn’t so shocking after all. As she got older and her health began to fail she was confined to a wheelchair, but inmates brought her gifts of rosebuds from the prison gardens–and staff members brought her flowers from their home gardens as well. Isa Lang in her 80s. Would Isa be evicted from prison? Yes, indeed. Her attorney, James Gunn, declared himself “flabbergasted” by the parole board’s decision. Even Los Angeles County Deputy District Attorney Charles Havens agreed: “I’m surprised at what they did. It just doesn’t seem the compassionate thing to do.” But the board decided to follow the letter of the law and using that measure Isa was released. Columnist Patt Morrison wrote about Isa in May 1983. At age 94, the former lifer was living comfortably with a “very compatible” elderly woman–a fellow vegetarian and Seventh-day Adventist. Isa Lang passed away in 1983 at age 95. NOTE: Again, many thanks to my friend and fellow historian Mike Fratantoni for directing me to this deranged tale. This entry was posted in 1930s, 1960s, Homicide, L.A. Times and tagged Charles Hillinger, Edith Eufala Norwood, Isa Lang, Patt Morrison by Deranged. Bookmark the permalink. I am glad that she had a couple of good years on the outside. I have a feeling that she would not have felt that way about prison today. It was a good thing that she did not get Judge Fricke! reputation. I”m fascinated by his career.